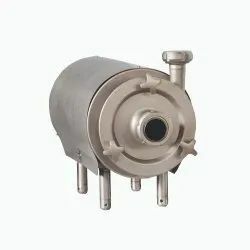 Prominent & Leading Manufacturer from Pune, we offer milk pumps - ss centrifugal type. Zeutech Milk Pumps are innovative, efficient, advanced and sophisticated centrifugal type mono-block pumps which are designed ideally for milk transfer in dairies, food processing sectors. Zeutech offers a modern range of centrifugal pumps which are systematically aimed at the products and pumping tasks of users. More than 25 years of extensive experience coupled with advanced cutting-edge technology and precise engineering calculations has made us the leading process pump manufacturer and exporter. The name ‘milk pump’ became quite a synonymous word to Zeutech pumps because numerous dairies use predominantly Zeutech process pumps for milk transfer. Our centrifugal pumps help in increasing process productively by providing high efficiency and gentle product handling.